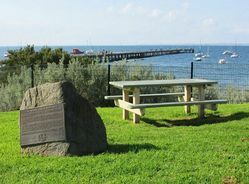 A monument commemorates the laying of the submarine telegraph cable across Bass Strait in 1869. In 1857 and 1858 surveys were conducted in Bass Strait to determine the best route for a submarine telegraph cable between Victoria and Tasmania. In August 1859, the first cable was laid, between Cape Otway and Low Head, near Launceston. Melbourne and Hobart were linked, completing the network uniting the capital cities of the four south-eastern Australian colonies. For a short time at least, the Bass Strait cable was the longest undersea telegraph cable in the world, although it was operational only until 1861. It was finally replaced in 1869. 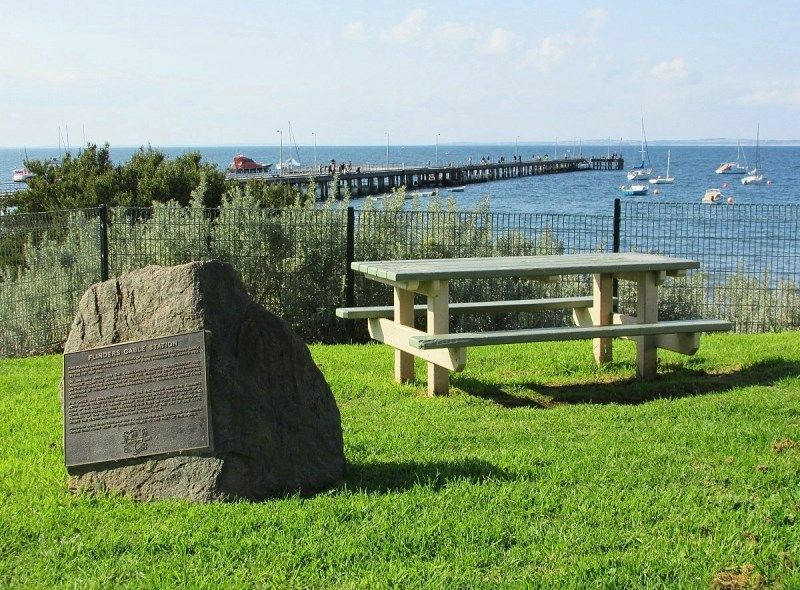 THIS PLAQUE COMMEMORATES THE LAYING OF THE SUBMARINE TELEGRAPH CABLE ACROSS BASS STRAIT, AND WAS UNVEILED BY THE SHIRE PRESIDENT CR. ALFRED BELL ON THE 1ST MAY 1993. ON THE 19TH APRIL, 1869 THE CABLE LAYING VESSELS "INVESTIGATOR" AND "PHAROS" BEGAN THE JOURNEY ACROSS THE STRAIT TO LOW HEAD TASMANIA. ON THE IST MAY THE GOVERNOR OF TASMANIA MR.CHARLES DU CANE AND THE GOVERNOR OF VICTORIA SIR HENRY MANNERS-SUTTON EXCHANGED MORSE CODE GREETINGS. 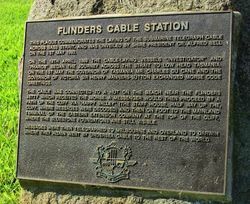 THE CABLE WAS CONNECTED TO A HUT ON THE BEACH NEAR THE FLINDERS JETTY WHICH RECEIVED THE MORSE. A MESSENGER WOULD THEN PROCEED BY A PATH UP THE CLIFF VIA "HAPPY VALLEY" (THE STAFF HOUSE, HALF WAY UP THE CLIFF, WHERE MESSAGES WERE DECODED) AND ON FOOT TO THE MAINLAND TERMINAL OF THE EASTERN EXTENSION COMPANY AT THE TOP OF THE CLIFF, WHERE THE BLUESTONE FOUNDATIONS ARE STILL VISIBLE. MESSAGES WERE THEN TELEGRAPHED TO MELBOURNE AND OVERLAND TO DARWIN WHERE THEY AGAIN WENT BY UNDERSEA CABLE TO THE REST OF THE WORLD.